This is the story of Neil and Yvonne Armitage, a couple of New Zealanders in their sixties who, in May and June 2009 broke from their own conventions to experience a six week sailing adventure in Greece. The dream became a reality. This is the first part of the logbook that describes this adventure. Click on the thumbnails to see a larger 800x600 photo in a new window. 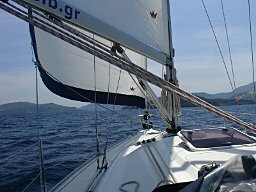 We motored “Spyros”, a Bavaria 33, out of the Kalamata marina just after 10:00am into a light 7-knot breeze, set sail and headed southwest. The day was as beautiful as ever warm with a few light clouds scattered over a blue sky. The breeze increased and backed to the southeast, which allowed us now to sail close hauled on a heading of 210º. At 17 knots of wind we took in 3 rolls on both the genoa and the mainsail and settled down to a good beat making 6 knots for the next hour. By 11:30am the breeze died and we drifted around making half a knot, if that. We only had a short journey today so made a sandwich for lunch and sat it out until the breeze returned. By now we were starting to learn a little about the fickle winds in the Ionian. It was a relatively short wait before the breeze did return now from the east, arriving at 8 to 9 knots and building to 12 knots. Rolls in the genoa and mainsail were shaken out and “Spyros” with a bone in her teeth revelled in the conditions. We were now heading due south and could lay Koroni, our destination, on the same port tack that we started on this morning. “Spyros” romping along in 17 knots of wind towards Koroni, the start of our return journey northwards. The return trip to Koroni was a wonderful sailing day, one of many that would build lasting memories of a fantastic six-week cruise. Yvonne and I had begun our charter in Lefkas 10 days ago. During the months of planning we had decided on a route that would first take us to our farthest point south, Kalamata, then work our way northwards into the Northern Ionian Sea as far distant as the island of Erikoussa before returning to Lefkas after six weeks. The southward route began with a short hop to Spartakhouri, on the Island of Meganisi then a 19-mile leg to Fiskardho at the northern end of Cephalonia/Kefallonia. This leg gave us a brilliant 12-mile sail, beating into 17 to 21 knot breeze from the southwest that backed during the afternoon giving us a 30º lift. Day 3 to Argostoli along the rugged west of Cephalonia was windless we motored until rounding Cape Yero Gombos then enjoyed a genoa reach at 6 knots into the Gulf of Argostoli. Pressing on southward from Argostoli we to picked up a 7 to 8 knot breeze in the late morning that took us out to sea from the Gulf of Argostoli before dying away to 4 knots leaving us to motor sail for most of the afternoon. Off the northern tip of the Island of Zykanthos a good breeze sprang up and we broad reached into the small port of Ay Nikolaos see toponyms doing 5 to 6 knots. On a flat glassy sea the next morning we motored southeast along the coast of Zykanthos, disturbing flocks of Shearwater gulls along the way. Once clear to the south of the Island a light breeze set in from the south west that enabled us to sail close hauled on a heading to Katakolon. Later the breeze lifted and backed so for 3 hours we reeled off the miles reaching along at 4 to 5 knots on a very hot and sunny afternoon. Day 6, a very light head wind and quite a strong sea current had us motoring all the way to Kiparissia. High clouds had built all day and I noted that a front might be coming in from the west. There was only light cloud the following morning when we left Kiparissia but we needed to motor for half an hour before a breeze filled in from the southwest. It built to 15 knots and under full sail we hurtled along at 6 and a half to 7 knots. Soon a lull in the wind signalled a shift, this time to the south and heading us, before it quickly built into a strong breeze that blew steadily at 27 to 30 knots. Off Marathopolis we gave up trying to sail and resorted to motoring. After consulting the Pilot book we discounted trying to shelter in small harbour at Marathopolis so pushed our way south to Pilos through 3 to 4 meter seas and gusts up to 32 knots. The left over swell the following day knocked any light breeze we could catch out of the sails so we motored the whole way to Koroni. Day 9 and in the calmer waters of the Messiniakos Kolpos - Messenian Gulf we enjoyed a day of light sailing to Kalamata and the end of the first stage of our adventure in Greece. The beautiful little harbour of Spartakhouri - Spartochori on the Island of Meganisi, in reality a parking lot for Babas’s Taverna. Three years ago Yvonne and I revived our interests in sailing by joining a flotilla charter in Croatia. Old sailing habits quickly returned so we repeated the experience last year with a flotilla charter in the Saronic – Argolic Gulfs of Greece and became captivated by the beautiful villages, the food, the climate and sailing in the Mediterranean. Within 2 months of our return to New Zealand we started planning our next sailing venture but for a much longer period this time. A 2-week flotilla charter was really just a taste and now we wanted the full meal. 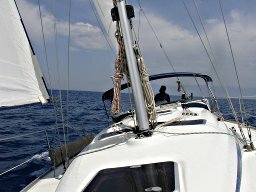 After trolling through many websites I came across www.sailingssues.com and began a dialogue with Diederik Willemsen who offered good advice and whose website is a great utility to and guide to sailing and yacht chartering in Greece. From Diederik we were able to find a reliable yacht charter company (one of several recommended by his visitors). By now our venture was starting to take shape, we had decided on dates, the Ionian area of Greece and had accepted an offer from the charter company. Yvonne and I had been sailing and chartering for more than 30 years and we had previously got by with practical experience but it was now clear that one of us at least was going to need to provide a certificate of boatmanship. I enrolled in the New Zealand Coastguard Boatmaster and VHF Radio Operators courses and duly received certificates for both. After trolling the web again we obtained a copy of the 10th Edition of Rod Heikell’s Greek Waters Pilot and at a local map shop I purchased a 1 in 750,000 scale, touring (road) map of Greece. We now started to plan in earnest. Where do we go for 6 weeks was the big question. What we were going to do was pretty obvious we were going to sail, moor-up at night, wander through the towns, sample the food, with the only condition that we visit Mt Olympia. But where to go posed more of a challenge. There were samples of typical 1, 2 and 3-week sailing itineraries in various websites but the Greek Waters Pilot became invaluable in planning our itinerary. The charter contract required us to reach the turn around point (point farthest away from the start) within the first third of the charter period and to be within 40 miles of the finishing point 2 days before the finish. With this in mind we planned to start our journey heading south and go as far as Kalamata, where we would see towns and villages typical of the Southern Ionian and old fortifications of the strategically important Peleponnese coastline. Retracting our steps along the Peloponnese coast we then intended to weave our way through the Inland Sea at a pace more leisurely than the urgency of our southward journey. For the final 2 weeks we would venture into the North Ionian Sea, criss-cross the South Corfu Channel then circumnavigate the Island of Corfu calling in to the island of Erikoussa, our most distant northerly destination. Then in 2 longish legs reach Vonitsa in the Gulf of Amvrakia - Ambracian Gulf for our last port before finishing in Lefkas. With all planning and packing finished and 2 days air travel behind us we finally arrived at the Lefkas quay early in the evening of 9th May. The taxi driver let us onto “Spyros”, Nikos the yacht charter company's local manager arrived later with some squab covers that had just been cleaned, we made a quick call to the nearest mini market before hunting down a Taverna, eventually climbing into bed just before midnight. Nikos arrived at 9:00am the next morning for a yacht briefing, complete the paperwork and carry out a last minute check and reparation of our inventory. We let the lazy line go just before 1:00pm and motored out of the town harbour into the Lefkas channel heading south. “Spyros” was a Bavaria 33, an upgrade from the Bavaria 32 that we had originally contracted. She was very comfortable, spacious; it was light with great headroom, even through the doorways, quite a bonus from our previous yachts. This was the first time we had sailed with an in-mast mainsail furling system that turned out to be a real gem. It was so easy to set, reef and retrieve the mainsail there were no real dramas when the breeze started to build and we had to reduce or stow the mainsail. The cockpit was comfortable with a large locker and folding table. The layout was generally good except for the sheet winches that, mounted on the stern quarters, we found quite awkward to use. “Spyros” at the town quay in Lefkas on the 10th May. 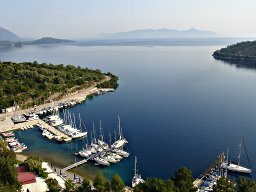 Lefkas port/marina is the best yacht charter base in the Ionian Sea together with Corfu/Gouvia to the north. She was a good sailor in light airs. Up wind she could reach a boat speed a little more than half the apparent wind speed. At greater than 15 knots of wind the mainsail would start to backwind “Spyros” would become sluggish and it was time to take 2 or 3 rolls in on the genoa. That certainly cleared the slot and the boat speed would leap up to 6+ knots, with that small sail reduction “Spyros” felt great and never overpowered. One really great day was the sail to Gaios. We had motored 4 miles out of Parga on a glassy sea before finding a light breeze that slowly built as it backed through several large wind shifts. “Spyros” was making a good 5 to 6 knots before the wind increased again to 15 then to 20 knots. We took in 3 rolls on the genoa and flattened the mainsail and “Spyros” got up to 7.2 knots and stayed there for the next mile and a half before we had to down sail and motor into Gaios. On a reach “Spyros” sailed quite well but did tend to gripe a bit in the gusts. Off the wind was something quite novel, as we never got very many following winds. One memorable run was in the afternoon after leaving Vasiliki. We sat in the harbour all morning with winds gusting up to 20 knots; they had weakened after lunch so we decided to leave. We expected a brisk sail down the large bay but the wind all but died away as we rounded Cape Lipso. It picked up again from dead astern so we set main to port and genoa to starboard and goose winged along making 4 to 5 knots for the next hour until we turned north and headed into the Meganisi Channel. Day one, from Lefkas it was a short reach down to Spartakhouri. “Spyros” was quite hard to sail in heavy weather and in big seas. Our trip to Pilos in a force 7 was uncomfortable, we had given up sailing when the wind reached 27 knots but we were still in the lee of Nisis Proti at the time. Once through the Proti Channel the seas were large and it became tiring trying to nurse “Spyros” through the troughs and avoid the inevitable slamming that befalls a beamy light displacement yacht, notwithstanding the white water across the decks. Again, on our journey north from Kiparissia to Katakolon we had 20 to 25 knots of wind directly on the nose. We had sailed for an hour earlier that morning in light winds but then resorted to motoring to get a few miles behind us, thinking perhaps that we might sail later in the day. Instead the wind continued to build pushing up a 2-3 metre sea which had us constantly helming to avoid as much as possible slamming into waves that would almost bring “Spyros” to a stop. Koroni, narrow streets thread their way downhill to the quayside. So, starting our journey northwards from Koroni we were soon into a light breeze off the headland below the castle and managed a short reach before having to motor to Cape Akritas after the breeze died away. Once round the Cape we picked up a 10-12 knot southwest breeze that held for about an hour before finally motoring into Methoni. Next step back to Kiparissia was to be one of our longest days at 40 miles. Out passed the Turkish tower on the headland we met a good northwest breeze head on so continued motoring for 4 miles to gain a sailing angle and a bit of sea room. In 15-17 knots of wind and a bit of a chop we made a frustrating 3-4 knots with the main sail back winding. Off the mouth of Navarinou Bay we took in 3 turns in the genoa and tacked on to starboard, our speed immediately picked up to 6+ knots. Tacked again but a current was heading us so with 13 miles directly into the wind to reach Sterno Proti, we dropped sail and settled down to a few hours motoring. Once through the Proti Channel we should have been able to bear off and sail towards Kiparissia but no, the wind died away so we continued motoring. The journey from Kiparissia to Katakolon was also long, a day that ending up motoring into a strong head wind and moderate seas. 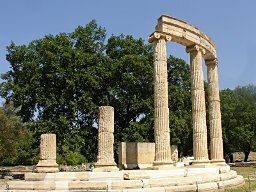 Monuments of Ancient Olympia, archaelogical sites of west Greece (sailing bases are Lefkas, Preveza, Poros and Athens). Katakolon to Mt Olympia was a 40-minute railway journey inland to the site of the original Olympic games. This was a must see on our very short list of things to do. It was nice to have a day off sailing. The countryside to Pirgos was flat and cultivated, onward to Olympia the modern train wound its way uphill through valleys to arrive at the forested site of Olympia. A day wandering through the monuments of Ancient Olympia was interesting, very hot and bustling with tourists. The port of Katakolon was a stopping place for large cruise ships disgorging hundreds of tourists daily, all intent on visiting Olympia, and the town is accordingly an up-market village focussed on the tourist trade with its designer shops and cafes with leather cushioned settees. Kiparissia, one lonely yacht in port overlooked by the town and castle: Peloponnese coastal cruising. 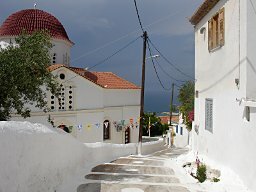 The towns and villages of the Ionian all have their own character. Some remain as fishing villages, others as larger regional commercial centres and many, large and small, are becoming increasingly dependent on tourists. Fiskardho, Poros and Sami; three absolutely picturesque fishing villages attracting large tourist numbers. Ay Nikolaos; 4 tavernas, a large bus park and a harbour of open boats plying tourists to the blue caves. 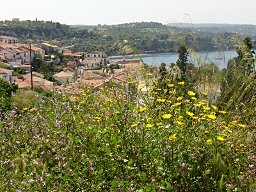 Argostoli and the towns and villages along the Peloponnese coast remained in their natural state. Koroni and Methoni in particular, each with its castle, narrow paved streets, town square, supermarket, church from which bells rang out the time every hour day and night, tavernas and painted fishing boats on the quay with their yellow nets. A short walk took us into a countryside covered in olive groves, grape vines and farmhouses. 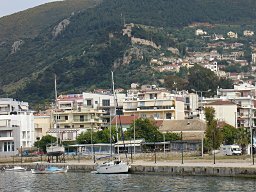 Kiparissia, like Argostoli, was a regional town very much off the tourist track. Koroni, behind the town the countryside is covered with olive trees and grapes: Peloponese yacht charters in the southern Ionian. Kiparissia harbour now has a north arm to the breakwater, a wonderful asset that few may have heard about, we were the only yacht in the harbour on our outward journey and one of 4 yachts on our return. The old castle on the hill above the town is a good walk with great views of the town and country. Kalamata; a large regional commercial centre was once the principal port of the Peleponnisos but seems to be suffering a decay seen in older towns whose status and influence is today declining. Fat black olives bear its name but we were unable to find any of these or Kalamata olive oil in the supermarkets. This was disappointing, perhaps our visit was too short or our expectations too great. 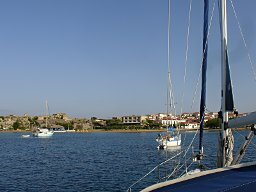 Methoni, a small town nestled between the castle and the countryside full of olive trees: Sailing Greece at its finest. It is the 24th May when we leave Katakolon after having spending two weeks on the southern leg of our adventure. A great shake down part of the cruise where we learned much about sailing “Spyros”, but spending longer days on the water and covering longer distances than we would need to in the north. We had also established a great shipboard routine that would continue for the rest of the cruise. Yvonne motored “Spyros” out of Katakolon harbour west around the cape then northwest for 5 miles before we set sail when the breeze came up. We managed 2 long beats of 9 and 11 miles before the wind eventually died, but not before a visit from a lively pod of dolphins that played around the yacht for a long time then disappearing as fast as they arrived. We motored the last 7 miles to Zakinthos.